Founded in 1991, The Hunger Project-Bangladesh is the nation’s largest volunteer-based organization. Our work has mobilized bottom-up, women-centered, self-reliant action in more than 800 village clusters or “unions,” which have union parishads at their center. Today, we are focusing intensively in 80+ unions to create “MDG Unions” – unions capable of achieving all the MDGs – as a demonstration of how this process of empowerment could be replicated nation-wide. Union Parishad Members: Initiate mass action campaigns to ensure 100 percent sanitary latrine coverage, 100 percent birth and death registration, and open budget meetings to provide transparency and accountability. Animators: 140,000+ volunteer leaders, 40 percent of whom are women, mobilize their communities, initiating development projects such as income-generating activities, and educational programs on nutrition and sanitation. Youth Ending Hunger: A program to unleash leadership and creativity, and foster a sense of social responsibility among 100,000+ students across the country. Shujan (Citizens for Good Governance): A platform of committed, active and socially conscious citizens to strengthen grassroots democracy, ensure transparency and accountability of local government, and carry out advocacy initiatives for policy reforms at the national level. 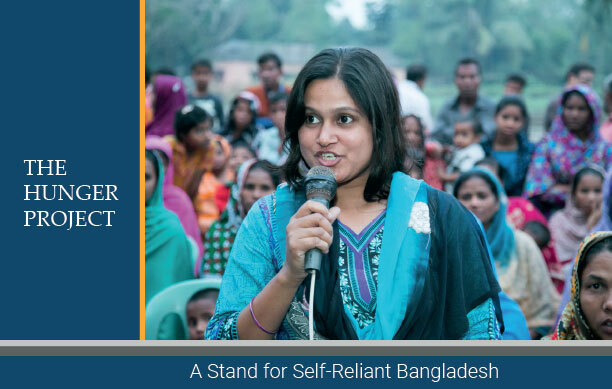 National Girl Child Advocacy Forum: An alliance of 500 organizations that coordinates the celebration of National Girl Child Day across Bangladesh to recognize the importance of girls in society and eradicate all forms of discrimination against girl children. Each year, on September 30, National Girl Child Day is celebrated across Bangladesh with rallies, essay and art competitions, debates and media events. Unleashed Women’s Network: More than 3,000 women, intensively trained in gender issues and women’s rights, reach out to all of the women of their villages and run campaigns against early marriage and domestic violence. Barefoot Researchers (Participatory Action Research): Volunteers from the poorest areas, the vast majority of whom are women, are empowered to analyze the obstacles they face, devise strategies and carry out campaigns of action to build lives of self-reliance.